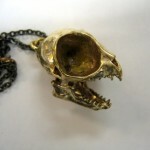 I tend to stick to cute over here at the RWT: la de blog, but I am fascinated with this incredible 3D Bronze Tarsier Skull Pendant by Moon Raven Designs. 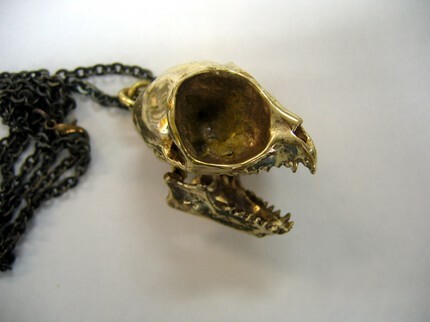 Mike, residing in Brentwood Bay in British Columbia, Canada, casts his jewelry from the actual skulls, talons, teeth, claws, and other bony body parts of animals who died of natural causes. What results is art that is wearable and wondrous. Tarsiers are one of my very favorite animals and their skulls are very distinctive. Look at how huge the eye sockets are! If you don’t know what a tarsier is, then I advise you to go watch one of the many youtube videos of these adorable alien-like creatures right now. Think of that scene in American Psycho. They thought it was the bee’s knees, but in reality, bone is boring! Moo MiniCards add little pops of color to that boring stack of business cards. If you’re a big fan of the cards, 3squares aka Jean from Raleigh, North Carolina has created a wearable way to network using them! 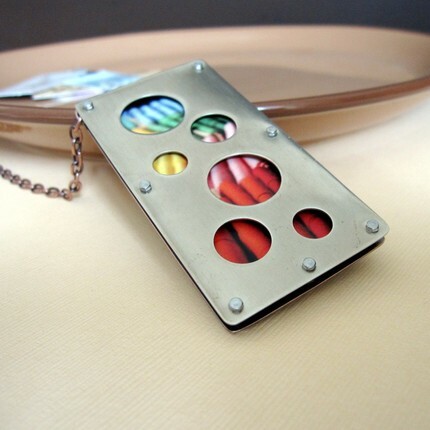 This fashionable necklace holds 4 (or 8 if you upgrade to a larger spacer), so you no longer have to carry a business card holder! Plus, the moo card in front will peek through the cut out circles. These are also available with cut out squares. Wear your art on your neck! How I have missed you: la de blog. There has not been a shortage of inspiring things, but there has not been enough time to write about them all! 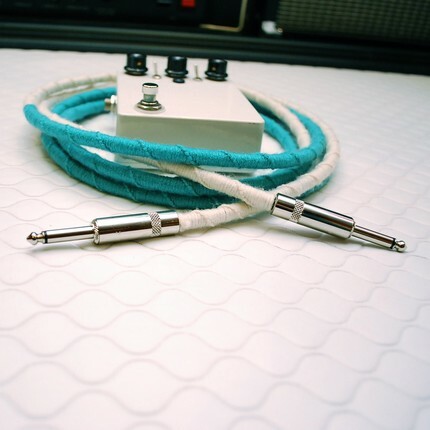 These cables by Chicago makers, Cordinated (Juli Sherry and Dan Somen), are not only pretty to look at, but make such a FUNctional gift for that musician in your life! A lot of work goes into these babies. Dan does the soldering of the cable to the plugs. Juli expertly wraps yarn in blocks of fun colors around the cable. Then they are scotchguarded to prevent them from picking up grime from dirty club floors. The best part: Cordinated cables can be made in the colors and lengths of your choosing. Dress up your beloved guitar or bass with a new accessory!